Wojtek Siudmak is contemporary Polish born artist who studied at the College of Plastic Arts and Adacemy of Fine Arts in Warsaw, and the École des Beaux-Arts in Paris. He now resides in France. Siudmak is a leading proponent of fantastic realism (sometimes called “magic realism”), a branch of fantastic art with one foot in classicism and the other in Surrealism. You can see both in his paintings, classical draftsmanship and technique in the service of free-wheelingly imaginative imagery. At times Daliesque, at others leaning toward Renaissance themes, Siudmak’s subjects swirl, morph, appear, disappear and fade from one image to another, occasionally revealing glimpses of hidden worlds. Siudmak was associated with a group of artists, writers and filmmakers in Paris who resisted the currents of Modernism in the late 20th Century and became associated with the fantasy and science fiction illustration community. 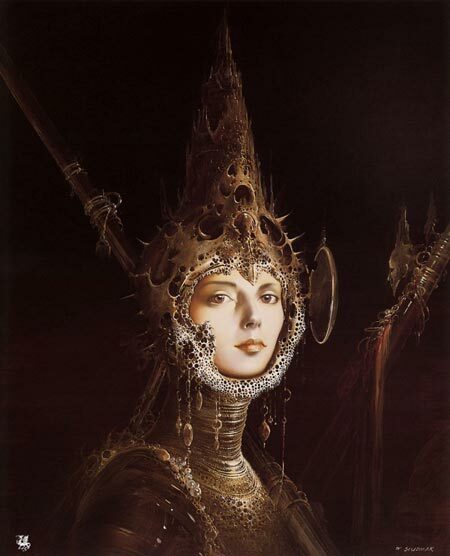 Siudmak’s paintings have been used for the covers of science fiction books, and he has actively illustrated others, including the Polish version of Frank Herbert’s Dune. He has a web site with a gallery of both drawings and paintings, though I found the “pop up and close” routine a bit tiring. You may find it easier to browse his paintings on other sites like The Funny Web (2 pages) and Museum Syndicate (3 pages), but come back to Siudmak’s own site to go through his drawings, which are poorly represented elsewhere. Note: sites should be considered mildly NSFW. 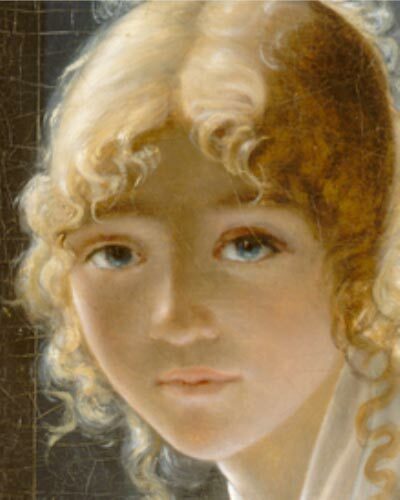 A question from a reader prompted me to revisit my 2006 post on Marie-Denise Villers, a talented but little known French portrait painter whose “one-hit-wonder” claim to fame was that her painting, now called Young Woman Drawing (detail, above), was for some time attributed to Neo-classical master Jaques-Louis David (also here). The painting, which I believe is a self-portrait, shows a beautiful and intensely focused young woman staring directly at the viewer and drawing in a portfolio sheaf in her lap. Through an enigmatically cracked window pane behind her, what may be a pair of lovers confers on a railed walkway atop a wall. The painting is beautiful and striking when you see it in person, and it seemed unfortunate that there was little information on the artist or her other works at the time I was writing. As the art resources on the Web are constantly being added to, I went looking to see if more information on Villers had cropped up in the three years since my post. The bad news is that there isn’t much more available on her. Apparently there just isn’t much information about her in general; though I did manage to find some links that I’ve added to the original post and listed below. The good news is that the Metropolitan Museum of Art, which has the painting in its collection, has added a larger, more color-accurate image to their listing, as well as a zoomable version of the image, which makes is possible to see the painting in more detail if you can’t make it to the Met to see it in person. I’ve used it to show the detail image above; for a view of the entire painting, and more of my comments on it, see my previous post on Marie-Denise Villers. The Met has also added the painting to their Heilbrunn Timeline of Art History and makes mention of Villers and her sister, Marie-Victoire Lemoine, who was also a painter, in their related article on Eighteenth-Century Women Painters in France. 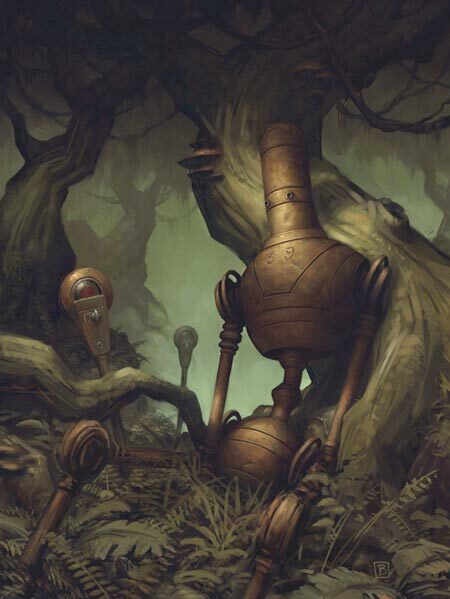 Brian Despain’s world-weary and weather-beaten robots may be the “every robot” in all of us. At times active and engaged, at other times forlorn and seemingly lost, his dented and roughly textured copper-skinned automatons carry a darkly humorous portrayal of our own place amid the natural world. I first wrote about Brian Despain back in 2006, when I pointed out my admiration for his approach to texture and subtle use of a controlled palette, plus my basic fondness for his original take on most things robotic. Despain’s work is currently on view in a show at the Roq La Rue Gallery in Seattle, Washington until December 5th, 2009. There is also a page devoted to Despain on the gallery’s site that includes a video interview with the artist. Despain’s own web site has been redesigned and expanded since my last writing, and there are also new resources elsewhere, including a Facebook page. You will find some larger images on this blog post about a 2008 show at Roq la Rue. There is also an iPhone app featuring Despain’s art, that can be appreciated simply as a gallery or used as iPhone wallpaper images, AppShopper review here, and iTunes link here. If, like me, you find yourself frequently frustrated with the relatively low resolution images provided by many museums and fine art sites; and tire of the frustrating little zoom windows that they provide for a “close up”, I have a suggestion for a site that you may not have considered. This site has nice large images of museum quality art that happens to be changing hands. It is the Sotheby’s auction site. Sotheby’s is a long established auction house through which some of the world’s most expensive (and notorious) art purchases have been transacted. Prior to their sales they post on their site previews of the items to be auctioned, in high enough resolution for potential buyers to take a look, and even bid online if inclined. For those of us who can’t shell out a few million for the odd masterpiece here and there, the site is still a treasure trove of relatively high resolution images of terrific art. You can’t pick and choose, of course; what’s up is what happens to be for sale, but I find it rare that I cannot check out an auction of art from the early 20th Century or earlier without encountering several pieces that make the visit worthwhile. They currently list an auction of American Paintings, Drawings and Sculpture that is due to be auctioned in New York on December 3, 2009. It includes work by Everett Shinn, Jessie Wilcox Smith, Andrew Wyeth, Robert Henri, Childe Hassam, Thomas Hart Benton, Norman Rockwell, Mary Cassatt, Edward Redfield, Frederic Edwin Church, Thomas Moran, J.C. Leyendecker, Thomas Eakins, James Bama, Frederic Remington, and N.C. Wyeth, among others. Click on “View E-Catalogue”, wait a few seconds for the pop-up window to populate with thumbnails, then maximize the window and scroll through the thumbnails to find what you like. Mouse over them to see the name of the piece and artist, and click to view the single piece. Then look for the “Zoom In” button below the image and use the plus sign to enlarge the image as large as it will go. The title block and zoom control can block part of the image, but you can get around that by moving your mouse to scroll. Exit zoom and you can then use the next and previous buttons to move through the images, or use the navigation to return to the thumbnails. The images are usually much larger than most encountered on the net, often large enough to see the brushstrokes quite nicely. From the main pages you can choose “Explore Auctions” and find sales of old masters, 19th Century art, Russian painting, Impressionist and modern art and a variety of other auctions scheduled in locations across the world. There are several pages of auctions listed at any given time. For any of them, click “Browse New E-Catalog” to get to the large images. There are also downloadable PDF catalogs for many of the auctions, but the images in them are not as large as those on the site. Come back in a few weeks, and there will be another set of auctions to browse. Do I see someone in the back raising their hand? Making a bid? No? A Question. “What about Christies?” you say. Yes, Christie’s is the other high end art auction site, and you will find some wonderful pieces there as well, but their display is limited to the more common zoom in a box feature, albeit a larger one than usual. The Sotheby’s display is much nicer (though it’s certainly worthwhile browsing through the Christie’s lots). So take a look through. You never know, you might find something you want to pick up for over the couch. I’m fond of retro-futurism, the appreciation of past visions of the future; often the “future” in which we are currently living. I’m particularly delighted with future visions rendered out in that wonderful ’50s & ’60s modern cartoon style that seems to be having a bit of a revival these days. Disney’s Magic Highway, USA is a classic in the genre. Originally part of a TV program aired in 1958, it took off from visionary speculation about the U.S. Interstate Highway System, the construction of which had just been authorized two years prior. The animation presaged some of the realistic aspects of that system, which had been championed by then-President Eisenhower as a national defense initiative. The animators then carried on into flights of imaginative fantasy about the future of automobile transportation. It is at once naive, silly, fanciful, astute, ridiculous, clever and, at times, surprisingly predictive of things like rear-view cameras, digital dashboard read-outs (“onboard teletypes”) and the equivalent of GPS map displays. Remember this is pre-Interstate Highway, pre-Jetsons, pre-space travel, pre-widespread commercial jet travel and produced at a time when computers as powerful as an iPhone took a up an entire room. It is also remarkably insightful in the prediction of the de-centralization of urban areas into an idyllic version of contemporary suburban sprawl. The animation and design work are a delight. Disney, both in animation and in their theme parks, often indulges in futurism, and this is one of the best examples from their animation studios. Unfortunately, I don’t know of a source for the animation credits. Milton Glaser is one of the most influential graphic designers of the last 50 years. Even if you haven’t heard his name, you’ve probably seen his work, from his iconic Dylan poster to his “I (heart) NY” design (yes, that one). Glaser has had a significant impact on design and illustration. He has new book called Drawing is Thinking. 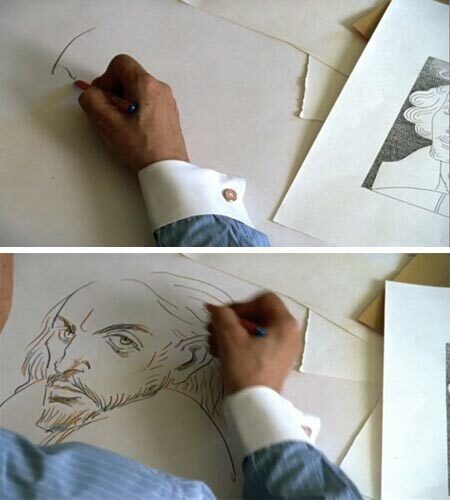 Shortly prior to the book’s release he was captured in this short (5 minute) video, Milton Glaser Draws & Lectures by C. Coy, in which he talks about drawing as he draws a picture of Shakespeare. (For some additional interest, here are some of Glaser’s cover illustrations for the Signet Classic Shakespeare series (part of a multi-page Flickr pool of Glaser designs and illustrations), and here is my post about portraits of Shakespeare. Curiously, Glaser appears to be drawing with some kind of multi colored pencil that changes color in the process of the drawing.